Take about 250 grams of spinach . Boil water and add spinach in boiling water boil it for 30 sec . Drain and put it in ice water for 2 minute . Drain and its ready to use. 1 Tbsp of olive oil make it very hot in pan . Fry about 1/4 onion cut thin and long untill they get light brown. Put 1Tbsp of Feta cheese and fry untill it melts . Add spinach and mix it . it tastes yum . If you like you could use black pepper. In a separate bowl take feta cheese scrumbled ,cucumber , tomato , parsley , yellow bell pepper green bell pepper, shredded chicken pieces ,Squeez one lemon , pepper and salt and olive oil . 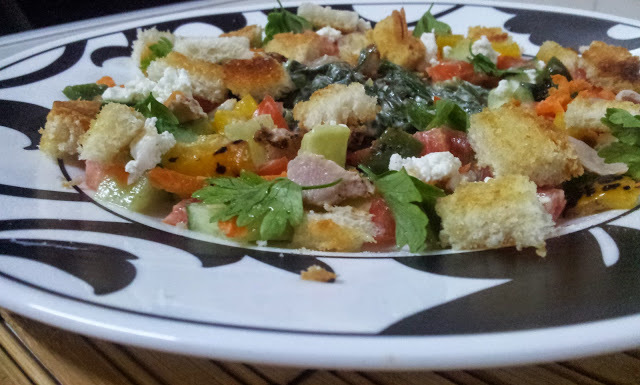 Mix spinach ,above mix and top with bread crumbs of 1 or 2 slice roasted buttered breads . I usually make sure that i add minimal quantity of each carbohydrate(bread) protein(chicken)and fibers in one plate to make the meal complete. This is me right there...i love me some greens anytime. I will try this for sure.